“You’re not storing an obituary for me, are you?” asks Duff Roman half-jokingly before shaking my hand as we meet at an Oakville Starbucks. Although we both laugh it off, he’s understandably a little wary as he proudly declares at the age of 80, “I’m the last man standing for a whole generation of DJs” when it comes to the history of Canadian radio and his pioneering part in so much of it. A member of several Halls of Fame - the Canadian Music Industry Hall of Fame, the Canadian Association of Broadcasters and the Ontario Association of Broadcasters, (the Canadian Music Hall of Fame’s Walt Grealis Achievement Award strangely eludes him) - the longstanding broadcast executive and entrepreneur has mostly forged his own path through a lifetime of incredible achievements, including pioneering Hot AC Radio and co-founding FACTOR. And even though he’s chosen a slightly slower lifestyle by relocating with his wife Sandra to enjoy wine and cheese in Niagara-On-The-Lake, Roman’s days are anything but retiring. He’s still keeping busy with a number of projects on the go: first and foremost, there’s his current gig consulting with the 18-station Evanov Radio Group. His duties allow him to work mainly from home, with a once-a-month appearance at Evanov’s Etobicoke, ON headquarters. “I’m generally a sounding board for Bill Evanov,” says Roman, who first met the founder and president Evanov when he attempted to roll out digital radio in the 1990s. Roman is also teaming up with Grammy-winning producer, archivist and entrepreneur Jan Haust (Bob Dylan: The Complete Basement Tapes) – with whom he served as senior consultant producer for the acclaimed three-part TV documentary Yonge Street, Toronto Rock ‘n Roll Stories 1955-1969- for an extensive series of Roman Records album reissues. The series features Roman’s original singles and album productions from the '60s, featuring Toronto rock and R&B performers that included David Clayton-Thomas and The Shays, and Levon & The Hawks. The Hawks recordings, of course, became the catalyst for Bob Dylan who sought them out for his famous “electric” folk trek. Roman Records is being resurrected and future releases will include archival and previously unreleased material with The Paupers, Little Caesar & The Consuls, Kay Taylor & The Regents, Jon & Lee & The Checkmates and others. These sides were all cut before CanCon had been conceived. Distribution discussions for the set are underway and Roman is confident the project - called Roman Records Presents - will bear fruit in 2019. But one of the more intriguing enterprises Roman has going is e-Radio, which offers a new income source for radio while also saving energy costs. Capitalizing on an invention by e-Radio president and CEO Jackson Wang, the company specializes in using data bits through radio airwaves to remotely activate and deactivate energy sources such as hot water tanks, thereby cutting electricity wastage. The product – which was awarded the 2015 Technology Award at the Las Vegas-based Consumer Electronics Show – is currently in the paid demonstration phase, and Roman is hopeful for an eventual global rollout once an investor or two comes aboard. “We’re doing paid demonstrations with the largest energy player in the U.S. – Duke Energy and Pacific General Electric on the West Coast - and we’re slowly trying to collate a consortium of radio networks; having done pilots with Entercom Radio Network, Alpha Media, Cox Media Group and National Public Radio – and equipment manufacturers,” Roman says. There is the role that radio plays, via FM sticks, in this energy savings process which Roman claims, could amount to millions and possibly billions of dollars in savings around the world. Roman says that FM radio stations will be able to generate a second stream of income from e-Radio. “Their main income still comes from what they do – which is the paying job of selling advertising and running radio stations,” Roman notes. “We may not need all the stations – even in Toronto – those signals from the CN Tower reach everywhere. So, we’re not going to save all radio, but we’ve found it another job. The Birth of "Digger Dave"
While he may be engaged in many ventures, Duff Roman will always be linked to radio, a medium that first spoke to him when “our battery radio was everything” as a 10-year-old child near Swift Current, Saskatchewan, where he was born Dave Mostoway. “It was our portal to the outside world and always magical to me,” says Roman. He was especially impressed that the night time airwaves carried a Hit Parade radio show on a station called The Voice of the San Bernardino Valley from far away California to the Prairies during his post-WWII youth. “That did it for me,” he recalls, and, because Swift Current had no station of its own, Roman took trains when he was 16 and “auditioned” at stations at North Battlefield, Regina and Moose Jaw, Saskatchewan and Medicine Hat, Alberta during his high school March break. After graduating high school at 17 in 1955, Roman took a construction job and then received a letter from Medicine Hat’s CHAT offering him a gig. Known as “Digger Dave,” Roman’s star ascended rapidly, landing in CKRC Winnipeg within a year, then returning to Medicine Hat as a TV announcer and then, home to Swift Current – who finally had a radio station at this point - as morning man and program director. A call from Jerry Forbes inviting him to join CHED Edmonton saved him, but it was a temporary stop as Jack Kent Cooke recruited him for CKEY Toronto within six months. The year was 1959, and it was Cooke – future owner of the L.A. Kings and Washington Redskins - who helped Digger Dave find his stage name. “I’d been working at CKEY a month, and Jack had been in the U.S on business. He was a hands-on guy who moved quickly. He’d critique everything, change format and then leave,” Roman recalls. The two began brainstorming ideas, eventually extracting “Duff” from a name bestowed by Duff’s old brother and “Roman” taken from the real name of his younger brother Raymond. Roman was shocked but followed Cooke’s advice. In January 1965, Roman was hired by Allan Slaight at CHUM for weekend shifts, and stayed on-air into 1968, part of a DJ lineup that included “Jungle” Jay Nelson, John Spragge, Bob McAdorey, Bob Laine and Brian Skinner– and one that was idolized by listeners. “We were one heartbeat away from what the kids wanted - their music idols,” Roman recalls. “You’d interview the artists, and sometimes you’d socialize with them. So that’s who we were. 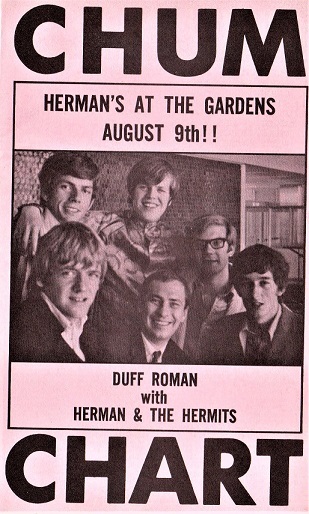 If we can’t get to the Monkees, we can at least talk to Duff Roman. “To that end, that link with us meant that we had kids at CHUM 24 hours a day. They’d be in the parking lot – noses pressed against the glass, you could see them at the studio, all hours of the day. They were always on you for autographs. Through the CHUM years – interrupted for six when he was then unceremoniously dumped by then-program director Larry Solway for refusing to change his job duties – Duff Roman rose in the ranks to Station Manager, then Vice-President Industry Affairs, followed by tenures as the Vice-President, Digital Radio Operations and later Head of CHUM Radio Division. Despite later roles as President of FACTOR and other ventures, Roman says his popularity is refined to Boomers.